Our most comprehensive wilderness course. In-depth training in nature, sustainability, wilderness survival skills, and more. Course runs Sep to Jun. Apply now - to receive priority for student housing and scholarships. Learn the most important skills for survival: shelter, water, fire, and food while gaining practical, hands-on experience. 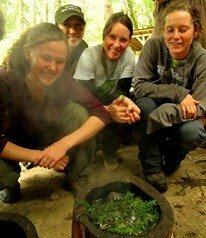 Learn how to utilize a diversity of native wild plants for food and remedies in the wilderness or at home. Forge your own knife while learning about steel selection, basic metallurgy, profiling, heat‐treating, grinding, and more. Learn the skills needed to forage for wild edible mushrooms! Spend a day learning about these magnificent fungi. "If you want to learn about wilderness survival and primitive skills from extremely knowledgeable instructors, Alderleaf Wilderness College is for you. I learned more than I ever thought possible at their classes." "Alderleaf Wilderness College is outstanding at developing and delivering wilderness skills programs, providing both a deep level of knowledge and context for the teachings." "I would recommend the Wilderness Certification Program to anyone wanting to reconnect with nature and a desire to live simply, with and for the land. Through this program I have become the change I was waiting for!" "Alderleaf provides a wide range of studies that will increase anyone's knowledge and understanding of the natural world." "Every course I've taken at Alderleaf Wilderness College has had a huge positive impact on my life and changed the way I look at, approach, and relate to the world around me." "Alderleaf is a wonderful school for learning how to live with the earth and not just on it." "Alderleaf Wilderness College's staff uses teaching styles that allows for all kinds of learners to learn and have fun. I use this knowledge all the time. I would highly recommend this wilderness survival school to others."